*45-60 minute workshops *We Come to you... no buses needed! Whose turn is it to set the table, the Periodic Table that is! Explore the world of chemical elements. Learn about atoms, build molecules and more! ILS 12.C.2b, 12.C.3b. We must not be dependent on gas! Have FUN as we discover many alternatives. Learn about biofuels & discover fermentation. ILS 12.E.3c. Discover amazing architecture. Have fun as we design buildings, bridges and more! ILS 12.D.3a. Discover why Carbon Dioxide is called a "Greenhouse gas". Figure out the sources and sinks in the Carbon Dioxide cycle and the part played by fossil fuels. Experiment with ice-cap melting to see it's effect on us. Drive solar cars as we learn about alternate forms of clean energy. ILS 12.E.2c. Edison's Workshop© Explore the amazing world of Electricity. Learn what's current as you make series and parallel circuits. Make an electroscope to keep. Try a Van Der Graff generator & get all the Hair - raising facts! ILS 12.C.2a. Find out what an indicator is to chemists. Discover the pH scale; learn about acids and bases, using common substances. Mix Chemicals & more! ILS 12.C.3b. Discover the amazing world of Biology. Experience osmosis; learn the jobs and parts of a plant and animal cell. Become a geneticist, extract Real DNA! ILS 12.A.3a. Step into the world of some really cool inventors. Get gassy as we meet Avogadro; learn about vacuums and atomic numbers. Discover cool Chemist as we do tick-tock chemical changes. Learn about cool inventors like Walter Fredrick, the inventor of the Frisbee! ILS 12.C.3b. Solve the crime by lunch time! Become a CSI technician as we discover a mystery powder, teeth impressions, lip prints, dust for fingerprints and much more. Do blood typing and extract REAL DNA.. ILS 12.A.3b. Discover wind chill effect; make heat go up and down! Explore the greenhouse effect, touch a cloud, relate to relative humidity, and more! ILS 12.E.3a, 12.E.3b. Discover all states of matter including plasma. Explore evaporation rates and the cool journey from liquid to gas. Discover liquid densities and much more! ILS 12.C.3a. Join us as we honor the contributions of women in science. Make your very own cold pack, change protein molecules right before your very eyes! Make a Saturn planet to keep! ILS 12.C.3b. Discover the difference between fission and fusion. Explore the many ways these powerful energies are sustainable. 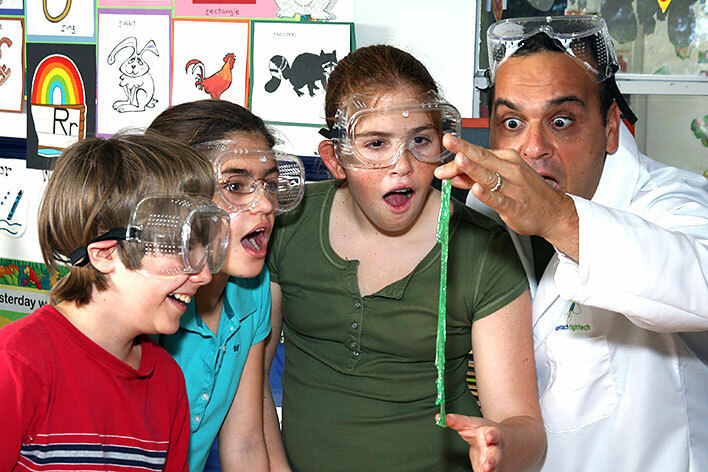 Have fun as we discover a chain reaction, create your own molecular fusion and fission reactions. Get energized as we work with lasers and photons. ILS 12.C.3a. Join us on a fun filled adventure as we discover several very famous African American scientists. Learn about their incredible contributions to science. Have FUN as we do some real cool experiments while honoring these great scientists. ILS 12.D.3a. Stay Cool, as this program really heats things up! Have FUN as we uncover the mysteries of the electromagnetic spectrum. Discover how light and heat absorb and reflect, as we encounter heat transfer and heat conduction. ILS 12.C.2a, 12.C.3a. Discover how molecules meet and greet and collide with each other. Make your very own molecule to keep! ILS 12.C.3b. Explore the cool and creepy world of the virus. Discover how a virus is neither alive nor dead. Have FUN as we learn how a virus invades a cell and takes over. Build your very own virus to keep, and much more.. ILS 12.A.3a, 12.A.3b, 12.A.3c. Contact our office or complete our on-line registration form to book your High Touch High Tech hands-on science experience today!